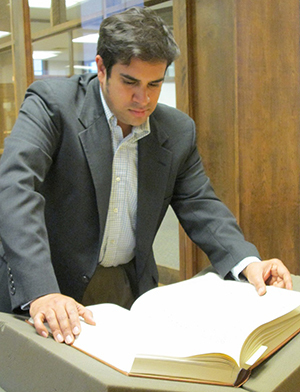 David Morris, a Ph.D. candidate in Notre Dame’s Department of History, has been awarded a prestigious Samuel H. Kress Rome Prize fellowship in medieval studies by the American Academy in Rome for the 2014-15 academic year. Established in 1896, the Rome Prize is awarded annually to approximately 30 emerging artists and scholars who represent the “highest standard of excellence in the arts and humanities.” Recipients are selected from among more than 1,000 applicants in a national, juried competition. They receive a stipend and room and board at the Academy, situated atop Rome’s Janiculum Hill. Notre Dame’s College of Arts and Letters has a history of success with the Rome Prize. Recent winners include Associate Professor of History Margaret Meserve, who won it in 2006, followed in 2011 by Albertus Horsting, then a Ph.D. candidate in the Department of Theology and now College Fellow in Harvard University’s Department of Classics. Morris is spending the year completing his dissertation, “Apocalypse Now or Later: The Super Prophetas of Pseudo-Joachim of Fiore,” the first comprehensive study of a 13th-century text that was falsely attributed to Joachim of Fiore. An Italian mystic, biblical commentator, and abbot, Joachim of Fiore devised a theory of history, which posited a coming age of the Holy Spirit that would usher in dramatic changes to the Church and society, and ultimately, a new stage of human development. The implications of this theory would turn out to be far more radical than Joachim imagined, according to Morris. “Joachim’s vision resonated with people for the rest of the Middle Ages and beyond, inspiring the most radical elements of the Protestant Reformation and the apocalyptic fervor of colonial Latin America” he said. Although his ideas had far-reaching implications and served as a bridge between the medieval and early modern periods, Joachim’s legacy has remained unclear, Morris said. While in Rome, Morris will be studying several manuscripts of the text, including the two oldest versions housed in the Vatican Library. He also plans to travel to archives throughout Europe. Following completion of his dissertation, Morris hopes to publish the first critical edition of Super Prophetas—a task that would be impossible, he said, without the fellowship and the freedom it provides. “I am supremely grateful to those who contributed to the application’s success,” he said, thanking his adviser John Van Engen, Andrew V. Tackes Professor of Medieval History and director of Notre Dame’s Medieval Institute; Brad Gregory, professor of history and Dorothy G. Griffin Collegiate Chair; the late Sabine MacCormack, who was the Rev. Theodore M. Hesburgh, C.S.C., Professor of Arts and Letters; and Bernard McGinn, Naomi Shenstone Donnelley Professor Emeritus at the University of Chicago. Originally published by Carrie Gates at al.nd.edu on November 21, 2014.